There’s a terrific new soul-food restaurant in Draper called Papa O’s. I’ll write more about Papa O’s soon, but this column is not about that particular soul food. This is about the food from the soul known as Jewish deli. I am happy to report that finally—finally—Salt Lake City has a respectable Jewish deli. I mean, sure, there are lots of great delis around. But, the Jewish deli is something unique. And, well, we just haven’t had a legit one here for the two decades that I’ve been in town. First things first, though: “Jewish” deli isn’t synonymous with “kosher” deli. Feldman’s Deli, which opened around Thanksgiving, is Jewish, but not kosher. The owners, Janet and Mike Feldman, refer to their operation alternatively as a Jewish deli (they’re Jewish) and as a New York-style deli, but not kosher. During one of my visits, for example, the daily special was kielbasa with buttered noodles—definitely not kosher, but definitely within the Eastern European tradition of the typical Jewish deli. I’m thinking that there must be a finite number of New York-style delis allowed in the universe. Therefore, maybe it’s not a coincidence that New York City’s venerable Stage Deli closed—after 70 years—the same week that Feldman’s Deli opened in Salt Lake City. Not that there’s really much comparison. Stage was an over-the-top deli with sandwiches named for the showbiz types that ate and schmoozed there, and with a menu as long as the Great Wall of China. Feldman’s, by comparison, is minuscule—but it delivers the goods. Prior to discovering Katz’s Deli in NYC, the first piled-high, overstuffed pastrami sandwich I ever ate was at the Stage Deli. The last one I ate was at Feldman’s. Even at $11.50 (with a side dish), the Feldman’s sandwich is about half the price of the Stage’s pastrami on rye and tasted every bit as good. Please take note: Feldman’s, for now, is only open from 11 a.m. to 3 p.m. The owners are worried that folks will come looking for dinner and be disappointed to find the doors locked. Dinner is coming, probably sometime in January, along with a beer license. But for now, Feldman’s Deli is solely a late-breakfast and lunch spot. As I mentioned, the menu isn’t huge. The focus is on half-pound sandwiches, and they are superb. I’ve been sworn to secrecy about where Feldman’s gets its pastrami and corned beef. I can tell you this: It’s from New York City. They also bring their Jewish rye bread in from out of town, since they haven’t quite found the right stuff here. Meats like pastrami and corned beef are heated up at the deli and sliced to order—never in advance, as pre-sliced deli meat dries out quickly. And so, succulent slices of juicy, warm pastrami, for example, are piled high on your choice of Jewish rye, sourdough, white or wheat bread. There’s also a choice of cheeses: American, cheddar, Swiss or provolone, and all sandwiches come shmeared with high-quality mustard. Don’t even think about asking for mayo in a Jewish deli. Now, some folks might balk at paying $11.50 for a hot pastrami sandwich, or $12.50 for a corned-beef Reuben. But these bad boys are so big that I’ve yet to be able to eat more than half a sandwich in one sitting, meaning I head home with leftovers for a midnight snack or for lunch the next day. And the sandwiches at Feldman’s come with very good sides: a choice of excellent coleslaw, potato salad or french fries. All the sides are housemade, and the quality of the fries was an especially nice surprise. Frankly, I wouldn’t even expect to find french fries in a Jewish deli. But at Feldman’s, they’re skin-on fries, made from scratch and cooked to perfection. Another great sandwich at Feldman’s is the Jewish salami ($8.50). It’s garlicky, all-beef salami with tons of flavor; with provolone, it’s a marriage made in heaven. There’s also an unusual take on the sloppy Joe ($12.50). Here, it’s made with corned beef, pastrami, Thousand Island dressing and coleslaw on a bun made special for Feldman’s. You can also get a turkey, roast-beef or ham sandwich ($9.50) with lettuce, onion and tomato—condiments you wouldn’t think of putting on pastrami or corned beef. Oh, and then there’s also Janet Feldman’s terrific chicken- and tuna-salad sandwiches ($8.50). How did all this come about? Well, both Janet and Mike Feldman hail originally from Newark, N.J., where Janet’s family owned and operated bakeries. Mike is a chemist by trade, and his work as a drug-testing specialist took him to Europe and the Olympics there, and then to the Atlanta Olympics and, eventually, to the 2002 Salt Lake City Olympics. He and Janet looked around and found that there was something missing here: a Jewish deli. Suffice it to say, they’ve remedied that problem. There are daily specials at Feldman’s, like the bowl of chili that I thought was a bit odd until I remembered that Katz’s in NYC has chili on their menu, too. Feldman’s also does authentic boiled-and-baked bagels ($2.50) that are simply exquisite. One of the daily specials recently was Janet’s housemade chopped chicken liver (yes, made with schmaltz!) on one of those spectacular bagels—and, well, it was so great that tears nearly came to my eyes. 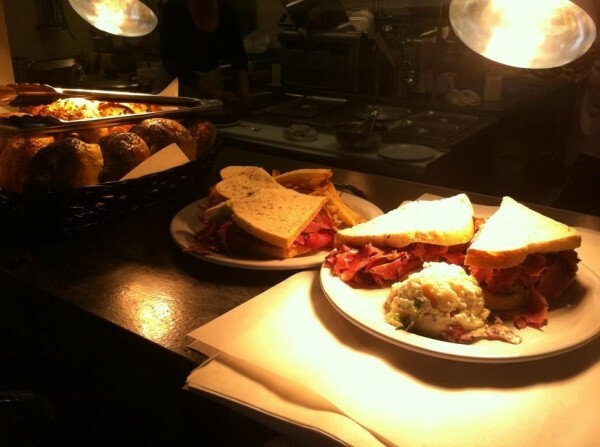 Don’t overlook the starters at Feldman’s. There’s a bona fide bowl of matzo ball soup ($4.50) on the menu, potato pancakes ($4), potato and onion knish ($4), gefilte fish ($4.50), and housemade kishka made with matzo and carrots ($3.50), bathed in a rich, dark-brown (almost black) gravy. Now, that’s what I call soul food! And what a terrific way to usher in the new year. Seasons Plant-Based Bistro changes up the game.